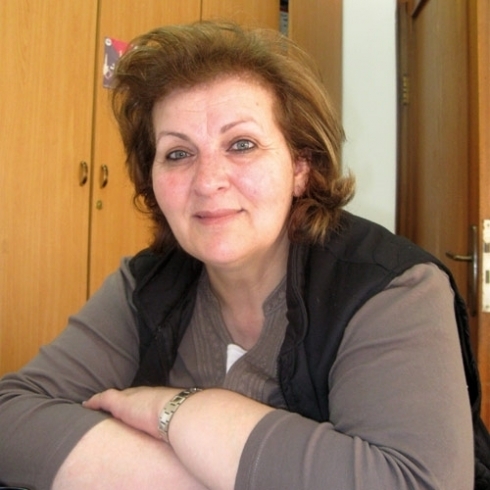 Amal Khreishe is a Palestinian feminist, activist and a political leader who has served as a general director of the Palestinian Working Woman Society for Development since 1995. PWWSD is a feminist, national, and development organization that focuses on women’s empowerment in private and public life. Mrs. Khreishe has led many campaigns to advance women’s roles in society, including the first program in Palestine to support violated women. She was also one of the founders of the International Women’s Commission for a Just and Sustainable Palestinian‐Israeli Peace to help resolve the conflict in accordance with international law and UN resolutions related to the Palestinian­‐Israeli conflict. Amal Khreishe is a member of the steering committee of the Palestinian National Women Coalition to Implement the UNSCR 1325, and she was a member of the drafting team of the National Action Plan for the Implementation of UNSCR1325 on Women Peace and Security in the State of Palestine 2017-1019 that was headed by the Ministry of Women Affairs. She is also a gender expert in the EU for the EURO-MED Ministerial Process that have geared by the Euromed Feminist Initiative. She has experience in training on gender equality, human resources development, advocacy and lobbying and interpersonal and leadership skills, locally and regionally.